Bet Shearim, recently chosen as protected site by the UN, is Israel's equivalent of Petra. True, it is less pink and spectacular at first sight, but the necropolis of the ancient Jewish community is fascinating. Bet Shearim is not mentioned in the Bible, and there is no evidence of there having been a settlement in Biblical times. It began its history as an inconspicuous village in the Roman era. The Jewish historian Josephus Flavius mentions that the Galilean village, Besara in Greek, was the central village of the agricultural estate of Berenice, the great-granddaughter of King Herod. A half a century later lived Rabbi Judah HaNasi (135-217 CE), the compiler of the Mishna and the main authority for the Jews. He established a Sanhedrin at Bet Shearim upon receiving a grant of land from the Roman emperor Marcus Aurelius with whom he had friendly relations. As the rabbi's adherents flocked to his religious school, the village's size increased. It became famous throughout the Diaspora, which stretched north from Lebanon and Syria to Greece and Rome and eastwards to Iraq and Persia, and south to the Arabian Peninsula. The Talmud mentions two magnificent buildings. Judah HaNasi himself spent the last seventeen years of his life not in Bet Shearim but in nearby Zippori, for health reasons, but he was brought back for burial in Bet Shearim: "Miracles were wrought on that day. It was evening and all the towns gathered to mourn him, and eighteen synagogues praised him and bore him to Bet Shearim, and the daylight remained until everyone reached his home (Ketubot 12, 35a)." 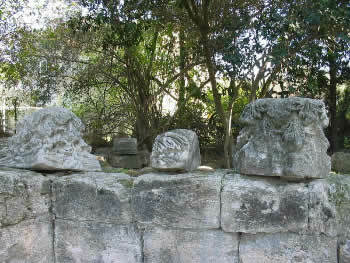 The fourth century saw a decline not in the amount of tombs, but in the quality of the sculpture. Later in that century the town was burnt, probably when the emperor Gallus Caesar suppressed a Jewish revolt against Byzantine rule. It dwindled back again to a village, and during the Arab period the dilapidated catacombs were ransacked. 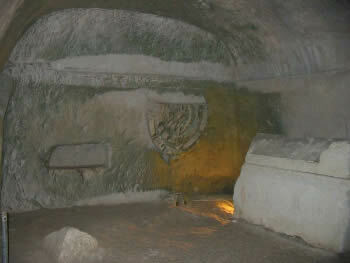 After all that, Medieval Jews apparently had lost memory of the great necropolis and the venerated tomb of Judah HaNasi in Zippori. Bet Shearim was only rediscovered in 1936. Guided tours are held in the park, but phone first for times. Bet Shearim consists of an upper city and the lower necropolis. The parking lot is next to the catacombs, and on a square an exhibition shows some copies of the inscriptions and decorations that can be found on the tombs and walls and accompanying explanation about them. Only a few of the 31 catacombs are open to the public. From the coffee house there are three mausoleums on the left, before the circular route turns right. Here it can already be seen that most of the tombs have similar features, which were probably imitated from the cave of Rabbi Judah HaNasi: a flight of stairs leads down to a courtyard, then there is a façade in the classical style with a carved stone (basalt) door, sometimes complete with metal door handle. Some of the doors are open so one can either look inside or enter it (torches are advisable because most smaller caves are not lighted). Note that the doors are mostly unbroken; the grave robbers entered the caves by breaking a hole in the façade above the doors. Some of the caves have an additional storey. One of the highlights of the tour is cave number 14, on the lower, main path, where Rabbi Judah HaNasi was purportedly buried. Purportedly, because there is no inscription which mentions him, although the names of three other rabbis are written on the cave's walls: "Simon my son shall be hakham [president of the Sanhedrin], Gamaliel my son patriarch, Hanania bar Hama shall preside over the great court." Hanania was a student of Rabbi Judah. The mentioning of his sons could be one clue that this could be the family grave. Family graves were the standard at the time, at least for those families that could afford them. 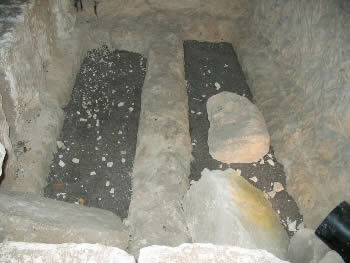 Rabbi Judah HaNasi's resting place could be the double grave in the third and last chamber, hewn from the bedrock and surrounded by a low wall of dressed stones. He had specified that he wanted to be buried in the ground; not in a sarcophagus. The outside three-arched façade to the cave is also impressive, although it is unfinished. But otherwise the simplicity of this family cave is in stark contrast to the ornate largeness and intricacy of the decorations in the cave next to it, number 20. 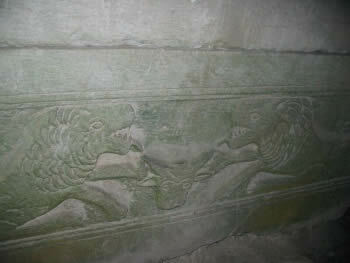 Cave 20 has many spectacular sarcophagi; in all 130 have been counted. Most are of limestone and some of marble. The cave's entrance has three stone doors, behind which lies a hallway of 50 m length, with many side rooms and junctions with side corridors which lead to new rooms. The overall plan is rather messy. This cave dates to the same period as that of Rabbi Judah HaNasi, and therefore the carvings of multifarious mythic and real animals on some of the sarcophagi are remarkable. There are even explicitly pagan mythological figures, of such deities as Eros, Aphrodite, Nike and Amazons; yet the people who were buried here included many rabbis whose names are grafted on the walls and coffins and gave the cave its nickname of "Cave of the Rabbis." The common explanation is that rabbis, even if they were orthodox, in the early days of Judaism made a distinction between images that were used during religious worship, like the candelabra, shofar, lulav and etrog, and those that were purely intended as decoration or that had a worldly application. There are also coffins with abstract decorations. Both caves 14 and 20 have upper floors and on top of it are open-air auditorium-like structures with benches and a wall with an apse. They were probably used for commemorations and prayer. Also cave 23 has a similar roof. As said, the catacombs that were dug after the one of Rabbi Judah HaNasi all conformed to the same basic plan. 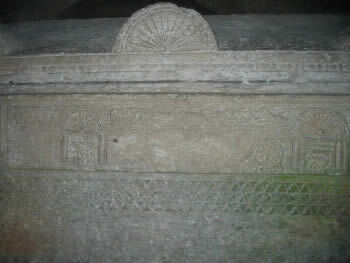 Catacomb 12 is the Cave of the Syrian Jews. It can be opened if one phones in advance. Its main attractions include a large menorah carved on the wall and 12 inscriptions in Greek and Aramaic. There is also a Greek-Hebrew inscription in the passageway between room I and room II: "Let me return (to eternity)," complemented with two menorah symbols on each side. 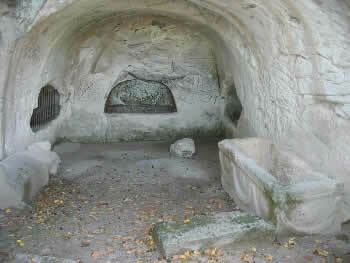 That this cave is meant for the wealthy can be seen by the single arcosolia (half-circle vault); whereas in the second room there is the same arrangement for the less wealthy (the vaults are for more than one body). In contrast, cave 13 is for the modest. Here there were 192 burial places, whereas catacomb 12 has only 56; and that on just one level, where no. 12 has four levels of burial chambers. By the way, these caves were not for separate families, which would have made them much too expensive, but more than one family was housed together. Also for financial reasons, there were no sarcophagi in any of the later caves: they were too expensive for most customers and also their weight of 4 tons would have made commercial mass burial too difficult and costly. The inscriptions disclose a wealth of information about the Jews who were buried here and their customs. Most inscriptions are in Greek, the lingua franca of the ancient world. Hebrew had by then probably disappeared as a spoken language, except for the use in religious services. 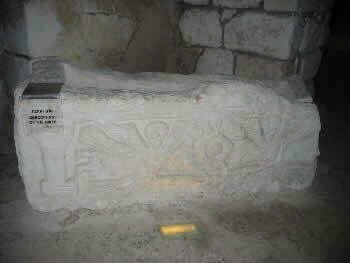 Some inscriptions are in Hebrew, or they are in Greek followed by Hebrew translation. Other languages that are used are Aramaic and Palmyran, a Persian dialect of Aramaic. Some of the inscriptions are of a religious nature, others warn outsiders not to disturb the bones that rest in the caves, and still others are of a private nature, e.g. 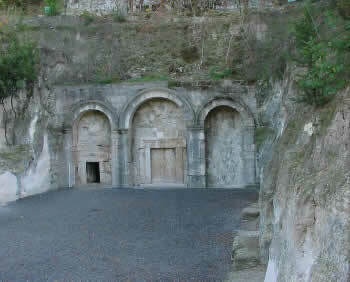 "The Loved One rests here (cave 15)." Cave 11 holds a dear family member: "This ossuary is one of the lowest placed coffins of all. And it is a good thing that it has been placed above. It is of my Uncle Papos, who brought us up. " Not all of the buried are rabbis, but also secular people bought a grave in Bet Shearim: merchants, government officials, a banker, a goldsmith. Some of the names are not very Jewish: there are Kyrilla and Arethas, the children of Hannibal ; there's also Kyrilos son of Ampilas. Other names are more recognizable as belonging to Jews, like Mikela and Sarah Maxima (with a Roman epithet added to it). They hail from cities like Antioch and Palmyra and Tyre. In any case, the inscriptions make ample opportunity to study name assimilation in the Greco-Roman culture of the Diaspora. What seems clear in any case is that Hebrew names were still being used as well. For instance a Germanus from Palmyra had a father who went by the name of Isaac. Sometimes the elders would have the assimilated name, and their offspring had Hebrew names, like in the inscription in catacomb 4 which reads: "Samuel, son of Isaac the poor, son of Anastasios." From the necropolis, back on the road by car or on foot, a visit can be made to the upper town. On the right of it (north-east), a path leads along a large public building in a rectangular structure with two rows of columns; it dates to the town's period of greatest prosperity, around the year 200. 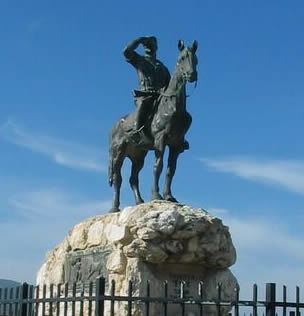 Behind it, on the hilltop, a monument of Alexander Zaid on horseback scans the great view over the Jezrael Valley and Mount Gilboa, whereas the horse's tail points to the green saddles of the Carmel mountain range. Zaid was one of the founders of the Hashomer watchmen's association, and his farmlands were here, on the corner bordering with Bet Shearim. It is said that either he himself or his peasants discovered the necropolis back in 1936. Behind the statue is the two-domed grave of Sheik Abreik, the name of the Arab village which was located here. Back to the road, one comes across the old city gate. It was superimposed on an olive press and another building. It can be noted still that the doorways on either side had to be modified. The olive was pressed by way of a horizontal beam hung on a notch in the wall, and the oil flowed through a circular groove in the plastered rock basin on the floor. Further south on the road still is the synagogue, but only the back wall of this is visible. Most of it is covered by a garden (behind the fence and bushes), which belongs to the Zaid Family House, which is inhabited. The buildings that lie before it, all dated to the fourth century, are private dwellings. In one of them a hoard of 1,200 coins was found. The synagogue itself is a rectangular with two rows of columns, of which some broken parts and capitals, carved in a leaf motif, can be observed. The entrance, through three doors, was south, in the direction of Jerusalem.